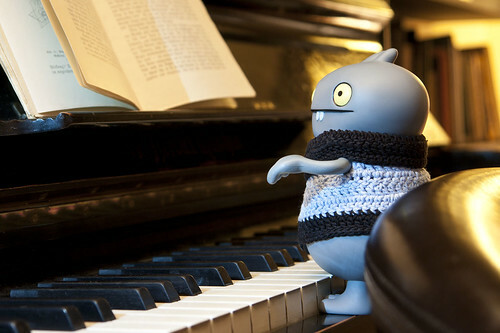 Uglyworld #1016 - Play It Again Babo (Project BIG - Image 74-365), originally uploaded by www.bazpics.com. Tonights while I was downstairs in the hotel waitings on Baz comings backs from workies I discovereds a piano in the areas near the bar. Backs on Uglyworld I had learneds how's to plays the piano and wasn'ts too bads either accordings to Wage and Tray who would oftens enjoyer to sits and listens to me tinklings on the ivorys. You can imagines my surprises when I finishes playing my favourites "the entertainers" song and gets a rounds of applauses from a fulls bar of peoples who then starts shouting "play it again Babo! ", so of course I playeds it agains for them, and agains and agains until Baz returneds, then I plays it one finals time more! I thinks I mades some new friendlies tonights too!